Finally, I’ve badgered another photographer into submitting a guest post - Hooray for skills learned as the baby sister! Today’s top-of-the-world view is courtesy of Paul Daniels, IT wizard and sometime backroads boulder-dodger. 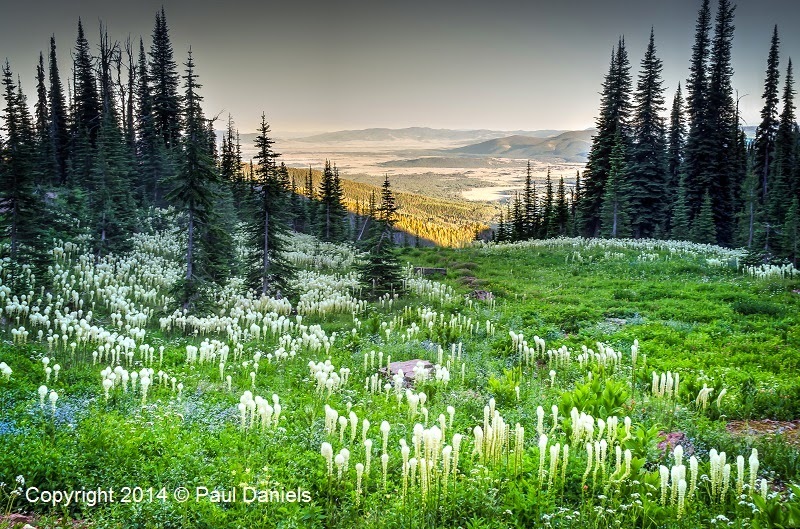 If you take it slow (and aren’t driving a low-rider), you too could ascend 8,000+ feet above sea level and view the beargrass up on Morell Mountain, in the Seeley-Swan range. The blooming’s long past in lower regions, but higher elevations mean cooler temps that allow for this delayed wildflower display. Thanks for sharing, Paul, and for visually inspiring us to gas up and get out to see more of Montana’s great outdoors. this is simply wonderful. thank-you for sharing! I would LOVE to be able to visit this place in person. A wonderfully astonishing benefit to living in Missoula, Montana, is that the wilderness is literally out your back door. Drive 10 minutes from the heart of town and you're in the National Forest. Drive 30-70 minutes and you have myriad opportunities for views like this. Off-season rates are just around the corner!